This is Rohr’s follow up book to ‘Falling Upward’, a book I highly recommend reading before beginning ‘Immortal Diamond’. In this book the author delves much deeper into the ‘second phase’ of life. ‘Immortal Diamond’ begins with this statement: “Your True Self is that part of you that knows who you are and whose you are, although largely unconsciously. Your False Self is just who you think you are – but thinking doesn’t make it so.” Rohr considers the True Self the ‘immortal diamond’ that is brought into consciousness through a process he calls resurrection. The reader – Catholic, Protestant, or otherwise – will find the author’s notions divergent from what has been traditionally presented by religion. Some will no doubt consider several key points even heretical. Phraseology will occasionally be unfamiliar. Press on. Rohr presents many Bible references to anchor his conclusions in scripture. Additionally he references many church fathers as well. This book is well worth wrestling through Rohr’s perspective. What can be wrong with a conclusion that confirms that God is love..unless you have somehow come to believe that God really isn’t? 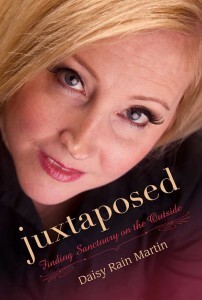 Juxtaposed is the heart-breaking life story of Vegas woman. It is honest in every sense of the word. It is not for the faint of heart, but it is a must read for any woman who was sexually abused as a child. This book will, undoubtedly, make you angry. Daisy would be the first one to admit – and actually does – that some will be so angry at the explicit way that she tells her story that they will toss the book away. Often it is easier to be angry at the messenger rather than the ‘stepmonster’. Others will want to hunt down the perpetrators and introduce them to the ‘millstone’. The story has an evil twist to it because all this takes place in the context of the ‘church’. Despite her ‘faithquake’, her faith grows. Yet all this begs the question, ‘why?’ Why would anyone persist in believing in a God who doesn’t deliver a heart attack to a sociopath who preys on helpless and innocent children? That question rises to the surface over and over again eliciting another flare of anger – at God. Juxtaposed is well written. As in most of our lives, Daisey’s story is a mix of humor and agony. She writes with such a vividness that her story will become etched within the readers’ minds as if it was their own. In fact, it may be very similar to your own story.